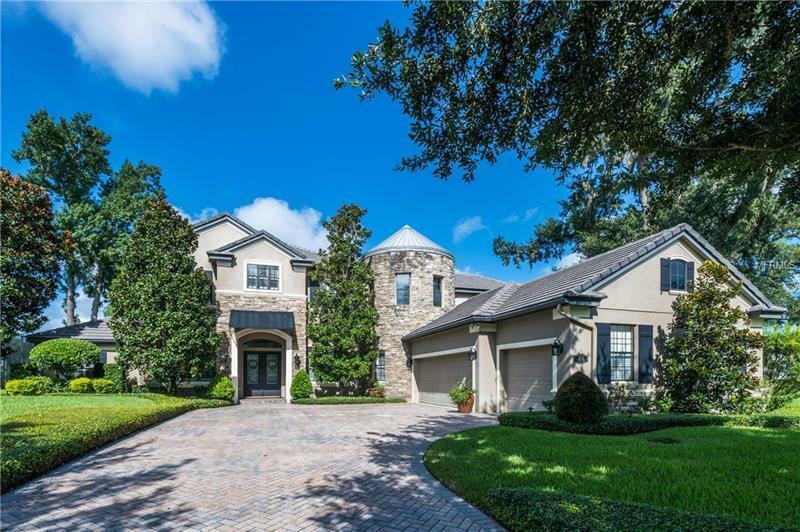 Absolutely stunning executive home nestled in the beautiful gated Ellington Estates neighborhood. This immaculately-maintained home awaits its new family and is listed UNDER MARKET VALUE! Plan your parties and family gatherings, as this home is made for entertaining! Open kitchen and family room, huge lanai and over-sized salt-water pool with stunning waterfall feature. Master suite on the first floor, as well as a separate bedroom and bathroom suite, suitable for guests or in-laws, tucked away on the opposite side of the house. Office and wet bar with wine refrigerator are great surprises in this fabulous home. Media room on the second floor along with the remaining three bedrooms. Additional features include custom wood cabinetry, stone counter tops, crown molding galore, custom lighting and custom window treatments. By the way, WOOD FLOORING throughout first floor. Master suite features walk-in shower and HUGE closet. The laundry room has a plethora of storage additional and an adorable mud room and backpack drop off. Over-sized three-car garage. Home is convenient to the 417, the 408, Downtown Orlando and the University of Central Florida.